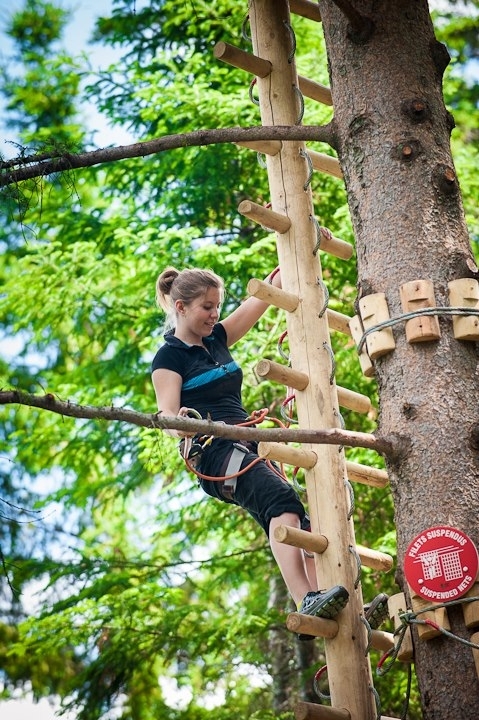 Specialist in the adventure recreation activities, d'Arbre en Arbre Canada Inc. will assist you in your development projects: Designer and builder of aerial course, suspended path, footbridge, zip line circuit, giant zip line, acrobatic courses in the forest, canopy tour, trails and recreation area. Our team of professionals will be able to meet all your expectations whether it is for a site study, complete construction, inspections and/or maintenance of your structures. Since 2002, d'Arbre en Arbre Canada Inc. develops a network of licensed parks in Quebec under the "Arbre en Arbre®" banner and in other Canadian provinces under the "TreeGO®" banner. Each park is unique. Safety, quality of facilities, diversity of games, respect of the environment ... Here are four good reasons to live the d'Arbre en Arbre® adventure. The concept can be implemented on artificial supports (towers, poles, wood or metal) to compensate for the lack of trees on certain grounds as well as inside buildings with sports or recreational vocation. D'Arbre en Arbre can accompany you in your projects of construction of courses in the trees. See our achievements.